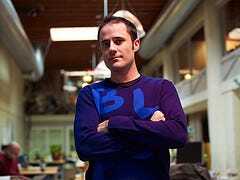 Twitter CEO Ev Williams just announced @Anywhere, a program to allow deeper Twitter integration on third-party sites. Ev made the announcement during a keynote Q&A at SXSW. @Anywhere will grant a wide range of sites access to data from Twitter feeds for use in a variety of applications. Ev demonstrated a feature called “Hovercards”, which brings up Twitter info on a person when a user holds the cursor over that person’s name in a block of text. It was widely rumoured that Ev would use this talk as an opportunity to announce new ad-integration in Twitter. So far, it appears the rumours had this one wrong, but this could be a source of revenue for Twitter.